Holograms suggest a depth and dimension that isn’t really there, an illusion of matter in space that can range from a low-tech flickering image in a children’s book to ghostly computer-generated projections of people on stage. 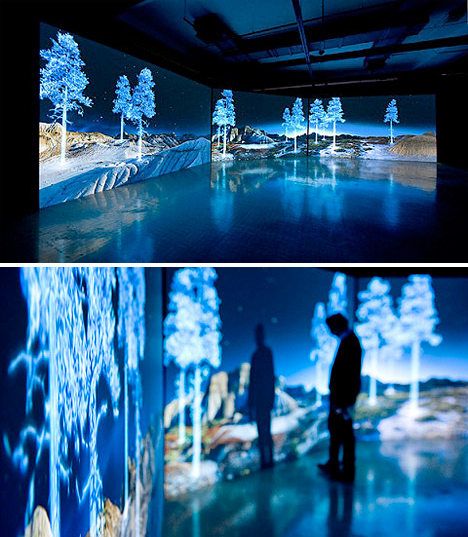 No matter how simple or complex the techniques used, it’s all a trick of the light, a way of fooling our eyes – whether they’re just images painted onto layers of glass or created with three-dimensional HDTV video. Visitors to the Singapore Art Museum found themselves surrounded by ghostly dancing figures, some playing instruments, in what seemed like a book of Japanese illustrations come to vivid, kinetic life. 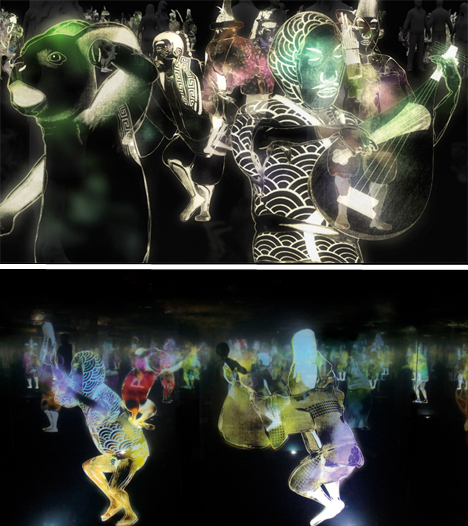 The maze of holograms is a digital installation by Teamlab, inviting anyone entering the darkened gallery to move within and even interact with the figures. 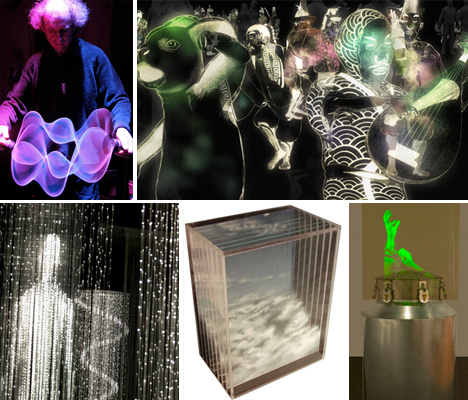 Each figure senses the presence of the viewer and responds by playing music, creating a ripple effect in other nearby holograms. 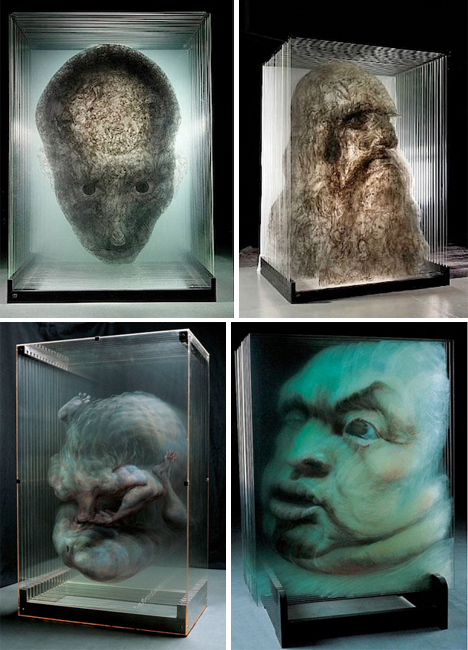 Depending on where you stand when you view these three-dimensional works by artist Seth Wulsin, you’ll see either a jumble of different facial features or a holographic image that seems to move slightly. 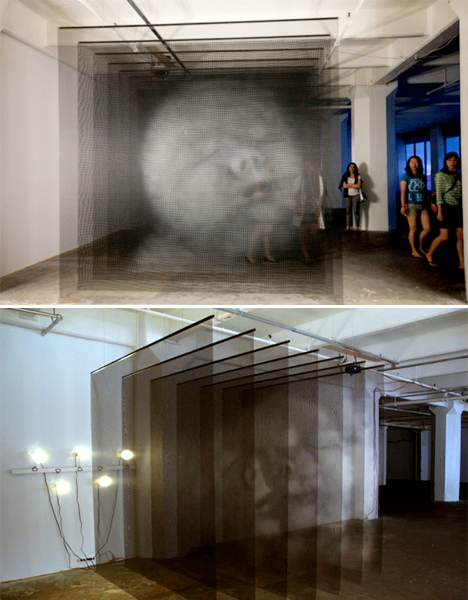 The large-scale pieces, entitled Ánimas, consists of portraits painted on suspended mesh screens. When viewed from the front, they come together into a sort of holographic image. Moving closer or further away gives each portrait extra dimension. Beijing-ased artist Xia Xiaowan paints imagery onto panes of glass with special colored pencils, and then layers the glass to create a three-dimensional appearance. This sort of ‘painted hologram’ achieves the same effects as high-tech holographic art in an entirely manual, low-tech way. Each image is made up of 14 to 30 panes of glass, seeming to move and shift as you walk around it and view it from different perspectives.